Engineering Encounters: What’s The Buzz on Bees? 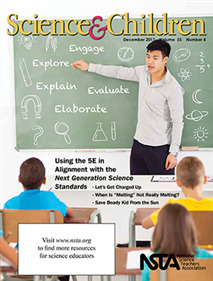 This column presents ideas and techniques to enhance your science teaching. This month's issue shares information about a flower anatomy and honeybee pollination unit that incorporates inquiry and engineering. 5 Engineering Encounters: What's The Buzz on Bees? This is an excellent article that shows the positive relationship that exists between plants and honeybees in a clear and concise manner. Each suggested activity has a thorough description of how to complete each activity as well as provide accompanying pictures. Overall, the article provides educators with many great ideas on how to teach children about various aspects of plants, such as their parts as well as how honeybees pollinate them. What I like about this article is the many hands-on activities that are included, which allow children to explore plants and the process of pollination in a fun and engaging way, such as dissecting a flower and building a hand pollinator. What is also beneficial about the activity ideas is that they allow children to foster other skills, such as reading comprehension. For instance, educators read the story Flight of the Honeybee where students discuss and have to identify the beginning, middle, and end of the story. This article also does a great job providing activities that require children to think critically about the information they read and learn, which can help with cognitive development.